« Ceci n’est pas une pipe. Our friend Bettina is one of the featured artists at Portland City Hall’s First Thursday show. That’s today, August 2nd at Portland City Hall, 1221 SW 4th. Show time is 5-8pm. There’s free food and drink, a mini-ramp out front and some great art by great artists. 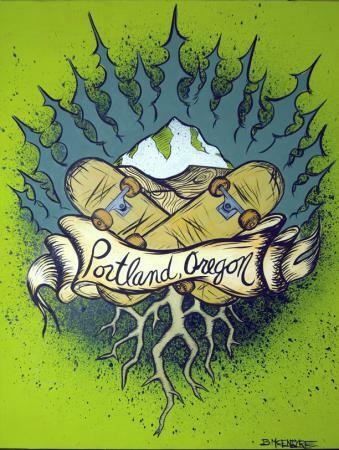 Skate Film Fest at the Mission Theater, 1624 Glisan, Friday, August 3rd @ 9:30pm. Thanks to AST Dew Tour, Adidas, Shrunken Heads Skate Shop and Ben Wixon. Update: Check out some pics from the event over at Skate and Annoy and Antigravity Press. Thanks for linking my name. I was surprised the city folks didn’t know it. Possibly a warning sign. you dead where are our photos of parts unknown.